Best tour we had in all of Iceland. Walked on a glacier, walked on the beach, great little lunch stop away from the large tourist sites, and of course the wonderful waterfalls. Would definitely recommend this tour with this great guide. Gudrun Helga is a wonderful guide. TOUR GUIDE RESPONSE: Dear Jenny, thank you for the great review. It was my honor to take you and Don on this tour and I greatly appreciate that you liked it. Thank you for recommending the tour, it's some great places to visit. Take care! Great tour with Gudrun Helga. She is very knowledgeable and more than willing to take photos for you. Would highly recommend this tour and especially this guide. TOUR GUIDE RESPONSE: Dear Jenny. Thank you for the visit in Iceland. Great that you enjoyed the tours. I love my job and hope that it shines through. I'd love to see you next time you come to Iceland. Take care! Gudrun was a great tour guide. We unfortunately didn't see the Northern Lights, but that was not because of Gudrun's effort. She was prepared from the beginning. She contacted me to move the tour time up a little bit due to cloudiness coming in later that night. We drove around trying to find clear skies to view the Northern Lights. While driving she gave us a lot of information on the Northern Lights, Iceland, and the places we stopped. I highly recommend Gudrun for any tour!! Thank you, Gudrun!!!! TOUR GUIDE RESPONSE: Dear Chris. Thank you very much for the great review. Please give my very best to Meghan. I hope you enjoyed the rest of your trip and are safely back home by now. Welcome back to Iceland! Firstly let me say that viewing the Northern Lights appears to be as much about luck as anything else. On this occasion the Lights were very reluctant to show themselves. This was in spite of the fact that Guðrún couldn't have tried harder to find them. We visited 4 different locations but only managed a glimpse. At the end of the evening we were in no doubt that we'd just been unlucky. But let me say again, Guðrún's efforts on our behalf were obvious and very much appreciated. TOUR GUIDE RESPONSE: Dear Alison and Gavin, thank you very much for the great review. I am very happy to see that you appreciated my efforts. Mother Nature is in control of the lights and sometimes we get a glimpse, sometimes we don't see anything and sometimes we get a big show. To see the lights we mere humans try to cooperate with Nature. :) Thank you again for the visit to Iceland and the great review, I enjoyed your company. We enjoyed a full day's tour of the Golden Circle with Guðrún as our guide. It's fair to say that we could not have been happier with the experience Guðrún provided. She is a highly professional guide who's primary objective appeared to be to maximize our enjoyment of the day. We visited every site that we wished to see and in addition spent a delightful hour having lunch in a tomato farm. Guðrún's communication via this site is excellent. HIGHLY RECOMMENDED. This was an amazing experience and a great way to see Iceland! Our tour guide, Guðrún Helga was very knowledgeable, professional and created an incredible day for us to see all the beauties of Iceland. We would 100% recommend this tour and our guide to anyone looking to have a personalized intinerary, great fun with a talented guide and a stress free experience! TOUR GUIDE RESPONSE: Dear Kevin and Kristen Thank you very much for the great review. It was my great pleasure to take you around and I am happy to know that you enjoyed the tour. Thank you again and happy new year to you both! Have a great travelling year! A perfect way to begin our trip to Iceland. Gudrun was helpful in making our plans and gave us a great, informative introduction to Reykjavik and Iceland. We erred in thinking we would have more energy after an overnight flight but we wanted to learn and explore on our first day. Thank you Gudrun for your patience with our need for coffee and cutting the tour a little short. It was a perfect time. We loved Reykjavik and meeting you! TOUR GUIDE RESPONSE: Dear Nancy, thank you booking with me. It was a great pleasure meeting you and your husband and taking you around. I will meet you again in Chicago. Until then - Take care! A wonderful guide for our group of four. She did an excellent job of explaining the sights along the way, always keeping things interesting. She paced things well, taking into consideration our physical abilities. Knowledgeable, patient, and upbeat, with a delightful sense of humor. TOUR GUIDE RESPONSE: Dear Kathryn, thank you for the great review. It was a pleasure to meet you all four and take you around! This was our last day trip with Gudrun and it was perfect. The national park was a treasure trove of things to see. Gudrun had met and exceeded all our expectations and the three of us miss her already now that we are home. If I ever go back, it would be to do it all again with Gudrun. She has my highest esteem and respect as a tour guide. TOUR GUIDE RESPONSE: Dear Nancy, thank you for all the great reviews and kind comment. I loved exploring the Icelandic nature with you. Please give my best grettings to Emmett and Jim. I hope to see you some day back in Iceland. This was our favorite!. Seeing Glaciers, volcanoes and waterfalls all in one day was unforgettable. Our grandson wanted to take a walk out on the Glacier and Gudrun brought appropriate gear to take him out. The picutres were stunning. We waited for them as we were not in condition to trek across a glacier. I particularly loved the Black Beach. It is magnificent and should not be missed but you could say that about the waterfalls as well. Gudrun made sure we saw it all. TOUR GUIDE RESPONSE: Dear Nancy, I am happy to know that you liked the south coast. It is indeed stunning and the black beach is a favorite to many people. Please give my best to your family. See you next time in Iceland! 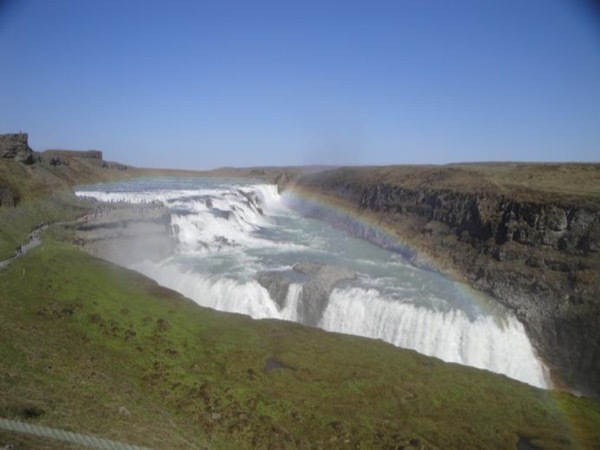 Our first long day tour with Gudrun was to see the Golden Circle. She is the most accommodating guide and we even had a chance to stop at a hot springs called the Secret Lagoon. My husband and I weren't game for a dip but our 17 year old grandson was. That was one of the highlights of his trip. Again, I highly recommend Gudrun's services. She is an excellent guide. TOUR GUIDE RESPONSE: Thank you Nancy, you and your family are wonderful and great company to travel with. Thank you for booking my tours and giving me the opportunity of introducing Iceland to you. It always increases my happiness to take my guests around! We were so lucky to actually see the Northern Lights. So many people come and never see them but our guide, Gudrun, was determined that we should see them. We were off into the countryside, hunting for them on a very cold night. It was such fun!. Gudrun had her camera and tripod with her and took photos of us with the Lights in the background. It is such a wonderful memento. And she also brought hot chocolate and a traditional Icelandic sweet to go with it. I hightly recommend her! TOUR GUIDE RESPONSE: Dear Nancy, thank you for booking the northern lights tour. I am very happy to read that you liked watching the sky in the cold darkness in my home country. Take care! Wow, great Northern Lights tour! With a little training and coaching from Helga, I was able to identify the lights over the Reykjavik Harbor as we rode out of town to darker viewing places. Everything was comfortable: car, hot chocolate, conversation as we waited and watched. And the lights were spectacular and something I will never forget. And I have a few great pictures to remind me of this special tour. TOUR GUIDE RESPONSE: Dear Kay, thank you very much for booking the tour with me. I enjoyed your company while watching and waiting for the lights to do their spell and I am very happy to hear that you liked the tour. Yes, it is nice, isn't it, to have pictures to "prove" that you really saw the lights. That's why I always try to take my camera with me to be able to send photos to my guests if we see the lights. What a wonderful way to see Iceland in a short time. We so enjoyed the private tour, our knowledgeable hostess and her insight. As we drove in her very comfortable and large van we could easily see the countryside and she filled the time with history and geology information that so enhanced our experience. If I came again I would travel with her. A perfect day! TOUR GUIDE RESPONSE: Dear Ricky, thank you for booking my tour. I enjoyed taking you and your friends around on the Untamed nature tour and I am very happy to know that you had a good day. I would love to be your guide again if you ever come back to Iceland. TOUR GUIDE RESPONSE: Thank you Dianne, it was a great pleasure to take you around! Gudrun is a great tour guide. Created a custom tour for us that we loved. TOUR GUIDE RESPONSE: Thank you James. Please give my best regards to Celine! Great tour. Answered all questions we had and was very accommodating to things we wanted to do during the tour. TOUR GUIDE RESPONSE: Thank you James, great to have you on my tour. Have fun for the next days! I have rated Helga for the other tour she provided, and say the same here--she did a great job and we enjoyed ourselves completely. Highly recommended. TOUR GUIDE RESPONSE: Thank you Michael, I enjoyed taking you around. We went Into the Volcano - the hike was longer than I expected but the experience was amazing - so many colors in the volcano amazing!!! Gundrun Helga made sure we were the 1st ones into the volcano as we had tickets to the Blue Lagoon later. She hiked into & out of the volcano with us. She was so helpful! Then Gundrun Helga took us to the Blue Lagoon where she made sure we were set before she left us with almost 2 hours to relax in the luxurious waters - & made sure we got back to the ship in time. TOUR GUIDE RESPONSE: Thank you Michael for the great review. I am very happy that you enjoyed your visit to Iceland and got to see and do everything you wanted to see and do within the time frame you had. That's what I'm here for. It's my great pleasure to help you make your dreams come true. This tour was amazing! Our guide Gudrun Helga managed to get us to so many sites in one day - & they were so beautiful & amazing! We saw Solheimajokull Glacier, 2 amazing waterfalls including Skógafoss where we had amazing rainbows, & then we saw the Gulfoss Waterfall (just amazing), the geyser (& saw them erupt) & Þingvellir National Park where the Northern American Tectonic plate and the European tectonic plate are separating. The next day we went Into the Volcano & to the Blue Lagoon - Great tours!! TOUR GUIDE RESPONSE: Dear Michael. Thank you for booking your tours with me. It was my great pleasure to take you and your family around and I am very happy to see that you enjoyed it. Take care! We enjoyed our tour with Guðrún immensely. She is local, highly knowledgeable, and a great tour guide. We'll look her up again next time in Iceland. TOUR GUIDE RESPONSE: Thank you Peter, I enjoyed taking you around. Take care! Helga was excellent and perfect for our family. Fast paced and knowledgable. I would highly recommend her for your trip to Iceland! TOUR GUIDE RESPONSE: Thank you Adam, it was lovely to meet you all! TOUR GUIDE RESPONSE: Thank you Chuck. Please give my best regards to your wife. Hope to see you back in Iceland! Gudrun Helga was an informative and charming host. She was generous with general information about Iceland as well as giving a thorough briefing on native food. We had a perfectly delightful afternoon with her! TOUR GUIDE RESPONSE: Thank you Lees, I'm happy to know that you enjoyed my food tour. Please give my best regards to your friends. Thank you all for the visit to Iceland! You cannot wish for a better guide. Gudrún was a goldmine of information and very flexible - accommodating our every wish and going the extra mile along the Golden Circle. Her care to look after my wife that was not that mobile was very much appreciated. Gudrùn gave us one of the most memorable days in Iceland, exceeding our expectations! TOUR GUIDE RESPONSE: Dear Nico and Anita, thank you for the great review. I am very happy to hear that you enjoyed the tour. I hope you have a nice trip to Greenland, I am sure our neighbouring country will be very interesting. If you ever need assistance in Iceland then I am here for you. Take care! I can't overstate how excellent Gudrun was during our week with her. She seems to know everyone in Iceland and we met with people all over the western part of the country. Gudrun delivered well above expectations. It isn't going too far to say that her work before the trip was extensive and complex. The work she did during the trip was even more tricky. Gudrun rolled with everything. She's a wonder worker. I learned so much about Iceland and am grateful for the opportunity. Book her - you won't regret it! TOUR GUIDE RESPONSE: Thank you very much for the great review. It was very interesting to meet you all and take you around exploring the nature and communities in the Vestfjords. If you ever need assistance in Iceland then I'm here for you. Take care! TOUR GUIDE RESPONSE: Thank you Raymond Denny for the visit to Iceland! Based on our experience Guðrún is the best guide in Iceland. She knows every single corner of the land and she can make the tours unforgettable. We spent a long day together and we learned much more things about Iceland than you could read in any book. Guðrún can make also the tours as a big adventure. We will never forget the drive trough rough interior of the Iceland with her car, which is very comfortable and custom-made off-road van. We strongly recommend this guide! TOUR GUIDE RESPONSE: Dear Michal, thank you very much for the recommendation. I am happy to hear that you and your wife enjoyed the tour. After all it was her birthday so of course I try to make it interesting. My best regards to you at home in the Czech republic, it was great to have you on my tour! TOUR GUIDE RESPONSE: Thank you Ellen for the recommendation and the visit to Iceland! Helga is wonderful. She gives you so much information is such a nice way. We were lucky to have her. TOUR GUIDE RESPONSE: Thank you Ellen. It was my pleasure to be your guide. Terrific tour of the city. You could tell that our guide truly loved Reykjavik and was proud to share it with us. We were treated to all the highlights and had a wonderful time. TOUR GUIDE RESPONSE: Dear Linda, thank you for the comment. It was my pleasure to take you around! Gudrun was a great guide for the day. Communication leading up to the trip was always prompt and thorough. The Ford Econoline van was a great way to tour the county - very clean and comfortable. She did a nice job of adjusting the specifics of the trip (when we saw the various highlights) based on weather and an additional horseback riding stop we added. Gudrun was knowlegable of her country and explained many things. She even gave us a little lesson on Icelandic music on the ride back. TOUR GUIDE RESPONSE: Dear DJ, thank you and your family very much for the visit and the great company. I enjoyed taking you around! Gudron Helga is an incredible guide. She knows the best secret spots off the beaten path, and has so much knowlege about the history of Iceland and the geography. She's warm, personal, funny and flexible. We highly recommend her as a guide. And she has a great Van that can handle any terraine. A real plus! TOUR GUIDE RESPONSE: Hi Terry! Thank you for the comment. It was great to meet you all and take you around. Please give my best regards to your family. Thank you all for the visit to Iceland! This was a great tour by a great guide! Our experience could not have been better. Our guide was extremely knowledgeable, diligent and enthusiastic. Gudrun Helga delivered well above our expectations, each day of our 8 day tour around the country. Her driving skills are exceptional. Her choices of hotels, restaurants, etc. went beyond all of our needs. Her English is fluent and she articulately offered fascinating cultural, political and historic insights about Iceland. Best guide we've had to date! TOUR GUIDE RESPONSE: Dear Harry, thank you for the great review, you are very kind to me. Please give my best regards to your wife and your friends. Maybe I will see you one day back in Iceland. This was quite an interesting and unique tour. Guðrún was a great guide. We taste tested some food that I never thought I would ever try like shark. She was very flexible and always gave us options on where to go and what to try. She also made the extra effort of dropping off her book on Icelandic food at our hotel the next day, so we appreciate that. TOUR GUIDE RESPONSE: Dear Lori, thank you for the great review. I thoroughly enjoyed taking you around. Take care! Guðrún was a great guide who took us all over Reykjavik. We loved everything that we saw. She was very flexible and accommodating since we stopped numerous times to capture those picturesque moments. She was also very helpful with translations and helping us communicate with some of the locals. TOUR GUIDE RESPONSE: Dear Lori, thank you for the visit to Iceland. I'm very happy to hear that you enjoyed your tours. Take care! TOUR GUIDE RESPONSE: Dear Robert, thank you for the four stars. I would have appreciated a comment in writing, it is always very helpful for us guides to know how we can improve our services in order to get five stars if possible. TOUR GUIDE RESPONSE: Thank you for the visit to Iceland. Welcome back any time! TOUR GUIDE RESPONSE: Thank you Shalini. Please give my best rgards to your family. My tour on May 12th with Gudrun was fantastic. She tailored it to my interests and showed me places I'd not have otherwise seen. TOUR GUIDE RESPONSE: Thank you, Susan, it was my pleasure to take you around. Helga is very reliable and communicated in a timely manner so we always knew what was going on. I booked the Northern Lights trip knowing it was unlikely to see something at this time of year and because the moon was getting brighter. Additionally my kids and I spent the day at the Blue Lagoon so we were exhausted when starting the journey. Helga wanted so much for us to have this adventure and when we did capture the Northern lights on our own cellphones we were recharged for hours! She is amazing! TOUR GUIDE RESPONSE: Dear Cindy, I am very happy that you got to see some great northern lights outside of the northern lights season and that you have your own photos, - that's great! Please give my warmest regards to your daughter. Thank you for booking with me, it was my pleasure to show you the northern lights! Gudrun Helga was an unbelievably great guide for our group of four. She is local and very knowledgeable about the history of Iceland from both a geological and a historical standpoint. Her super Jeep is huge and allowed us to visit many places that normal cars could not get to. Also important, she knows where all the clean bathrooms are along the way and the best restaurants. You will not be disappointed with her as your guide. She went above and beyond to make our trip as memorable as possible! TOUR GUIDE RESPONSE: Dear Nick, thank you for the blushing review. It was my pleasure to meet you all and taking you around for these five days here in Iceland, I am very happy that you liked it. Please give my best regards to Cheri, Anna and Brian. Hope you all have a great traveling summer 2018! Guðrún was a fantastic guide. I combined her Icelandic Food Tour with her Northern Lights Tour for the same day, and she was more than accommodating. Searching for the Northern Lights was a lot of fun! It was nice to go to places where there weren't other tourists and have the coast and the sky to ourselves. We had so much fun on this trip, and Guðrún deserves a lot of the credit. TOUR GUIDE RESPONSE: Thank you Kevin, it's was my honor to introduce Icelandic food to the two of you and joining you on a northern lights hunt. Please give my best regards to Joshua! Guðrún was a fantastic guide. I combined her Icelandic Food Tour with her Northern Lights Tour for the same day, and she was more than accommodating. We did not stay in Iceland long, but we loved walking around Reykjavik and getting to know the city and the country - especially through food and drink! We had so much fun on this trip, and Guðrún deserves a lot of the credit. TOUR GUIDE RESPONSE: Dear Kevin, it was my pleasure to take you and Joshua around in foodie Reykjavik and on the northern lights tour. If you ever come back to Iceland, I'd love to see you again! The guide was excellent and really tailored the tour to our interests. I am a school director so she arranged for us to visit two schools in Reykjavik and meet their directors. It was a rare opportunity! TOUR GUIDE RESPONSE: Thank you Carolyn, it is always a great fun to make something new and different. It was my pleasure to use my connections and organize visits to the two schools in Reykjavik for you. Glad that you enjoyed it! We had Gudrun for 2 days, she was awesome!!! She was very organized and very knowledgeable! She made sure we saw everything on our bucket list. I would highly recommend her as a guide! TOUR GUIDE RESPONSE: Dear Andrea, thank you for the great review. It was my honor to introduce Iceland to you all so thank you very much for buying my tours. I enjoyed spending those two days with you and I am very happy to hear that you enjoyed that too. TOUR GUIDE RESPONSE: Thank you all for the visit to Iceland. It was great to get to know you and I am very happy to hear that you had great time during the snowmobiling tour. It's truly an adventure to go on the glaciers! Our 40th anniversary celebration trip to Iceland was a an awesome experience thanks to Gudrun Helga who is not only a great tour guide but a very accomplished person and an encyclopaedia of information and local tales. She has also written a book on Icelandic Food. Both my wife and I thank Gudrun Helga for making our time in Iceland very special and we appreciate the huge effort she made to ensure we had a fulfilling tour. TOUR GUIDE RESPONSE: Thank you Colin for this great review. It was my honor to take you and Leeann around on your 40th anniversary celebration trip. I hope you will always remember Iceland, the snow, the storms and everything that happened during those ten days you had here in Iceland. It was truly an adventure. Hugs to Leeann. Take care, both of you! TOUR GUIDE RESPONSE: Dear Len Thank you all for the visit to Iceland. It was great to have you. Happy New Year to you all! Gudrun has been both a warm friend and a fantastically knowledgeable guide. She answered even our most obscure questions thoughtfully and insightfully, was flexible and accommodating and timed breaks perfectly. We can't thank her enough for making our trip so memorable and we hope to come back and meet her again soon! TOUR GUIDE RESPONSE: Dear Julie and co I am very happy that you liked the van, the facts and the brennivin. Brennivin used to be taken on journeys in the olden days to warm the travelers up so why not after some snowmobiling... ;) Thank you again for the visit, I enjoyed being your guide! TOUR GUIDE RESPONSE: Thank you, Julie, very much for these kind words. I thoroughly enjoyed taking you and your family members on the northern lights tour and I am very happy that you liked it. You are free to use the photos as much and wherever you like. Please feel free to contact me again if you ever come back to Iceland! Guðrún very informative and friendly guide..even though we cannot see the northern lights, but her friendly makes us happy through out the tour. And we also should thanks Guðrún for photos that she email us. Thanks Guðrún. Excellent guide with a great deal of local knowledge. TOUR GUIDE RESPONSE: Thank you Tom. I hope you enjoy the rest of your stay here in Iceland! Delightful, informed, committed guide! We had such a good time hunting the Northern Lights. And she took pictures and sent them to us. TOUR GUIDE RESPONSE: Dear Kimberly, thank you for the great review. I am very happy that you enjoyed seeing the northern lights. Hope you like the photos. You are welcome to contact me if you ever visit Iceland again. Take care! What a lovely tour! Gudrun was knowledgable, accommodating, a great driver on the roads and easy to be with. She had lots of information to give, not just at the sites we were at but also in between talking about volcanos, climbing areas and other cool things along the way. We didn't have to rush even though we had added stops that were for me, she knew how much daylight we had to enjoy the big sites and knew the time well. I would definitely recommend Gudrun as a tour guide, and plan on hiring her again! Professional guide, took us to historical points with detail explanation. Responsible. Good and responsible tour guide. Explanation in details. What a lovely person Gudrun was. The tour was even more spectacular than we expected. She told us a lot of history and stories about the Icelandic culture. She even made sure we saw a few things that we didn't expect. She had a sound system in her van (we were 8 people), so everyone was able to hear her while we were driving. Highly recommend her for any tour you might want to do in Iceland. TOUR GUIDE RESPONSE: Thank you too, it was a great pleasure to meet you and take you around! TOUR GUIDE RESPONSE: Dear Peter, thank you for the comment. I am very happy that I could step in for Lisa and take you around. We loved our tour and Helga was a fantastic guide, so knowledgeable and helpful. She tried so hard to fit in all our sight seeing requests and didn't let us down. We had very limited time being over 3 hours late into port. TOUR GUIDE RESPONSE: Dear Robyn, thank you very much, it was my pleasure to take you around! Excellent. Professional. Flexible. On time. Knowledgeable. We feel exceptionally grateful to have had Guðrún for our tour guide for three days in Iceland! We got to see amazing scenery and Guðrún is so knowledgeable about geology, current affairs, Sagas and all things Iceland. It is a memory we will cherish. We had Gudrun Helga 2nd day in a row, and it was spectacular! extremely informative and flexible. ended my bday celebration by her surprising me with fermented shark + shot of icelandic liquor! she is extremely passionate but thoughtful, am greatly thankful to knowing her! It was such a long day BUT Gudrun Helga made it seem so short and time passed so quickly. She is EXTREMELY knowledgeable, a journalist herself - super grateful to have her as our tour guide. Aside from sites, she told us folktales as well as culture & history behind each sites along the drive, and to be honest - i felt very immersed into the whole region. Looking forward to her again, would give her a 100+ stars if I can! Excellent guide... friendly, knowledgeable and gives good service! Gudrun Helga was a wonderful tour guide, knowledgeable, enjoyable to be with, helpful in showing us sights she thought we would enjoy in addition to the Golden Circle. It was a great day and we thank her for such a lovely day!! TOUR GUIDE RESPONSE: Thank you too Cynthia. It was a pleasure to travel with you all! My family of four enjoyed a wonderful tour of the South Coast of Iceland with our guide Helga. She graciously agreed to postpone our tour due to weather. We had a wonderful 11 hour tour that included a hike to a glacier, black sand beach, waterfalls, and more. She was pleasant, informative and a true pleasure to travel with. Our highest recommendation! Gudrun gave us a two day tour of Iceland. She was helpful and professional in planning and proving the tours. She was very knowledgeable, informative and patient. She showed us the awesome sites of Iceland and although the second day was a long one she paced it well with stops and sights along the way to the Lagoon Glacier, which was the highlight. We left with appreciation for her service and an overwhelming impression of Iceland. We highly recommend her and her comfortable vehicle. TOUR GUIDE RESPONSE: Thank you Darrell for this nice review. I thoroughly enoyed taking you around. Thank you for the visit to Iceland! Our family of four enjoyed a private guide of a national park in Iceland. Helga, our guide arrived on time at our Airbnb apartment in a comfortable van. We enjoyed an informative thorough tour of an interesting region that included volcanos, glaciers, seashore, waterfalls and lava fields. She discussed the history, wildlife, and geology of the region. She offered frequent stops to explore the region and was patient in answering our questions. We thoroughly enjoyed our tour with Helga. Gudrun was an excellent guide. Very friendly, knowledgeable and accommodating. We felt like she exposed us to factoids and information that we wouldn't find in a guide. We had a wonderful city tour with Gudrun Helga! It was a rainy and windy morning so it was very comfortable in her warm and spacious van. She is kind, knowledgeable and so pleasant to be with. She knew we were Catholic and took us to a convent outside the city that she knew about because she grew up near it. It was the highlight of the morning. She also showed us where to buy wine and dropped us at lunch. We enjoyed being with her and the tour hit all the highlights of Reykjavik. TOUR GUIDE RESPONSE: Thank you Shana, I really enjoyed taking you and your family around. Please feel free to contact me if you ever come back to Iceland! This tour was a long day but Gudrun Helga did a lovely job touring us around the peninsula. She accommodated my special request of lunch at Hotel Budir and showed us all the spectacular scenery. She had many stories and much information about the history. She is very knowledgeable, kind and easy to be with. She also stopped numerous times for our many snack and bathroom requests so we appreciated her flexibility. She told us a lot about Icelandic culture which we appreciated. It was a great day! TOUR GUIDE RESPONSE: Dear Shana, thank you for the lovely day on the Snaefellsnes peninsula. I agree with you, Hotel Budir is a very nice lunch stop so I am definitely going to take more group there. Thank you for the nice review and please give my best regards to Rick, Madison and Carly - thank you all for the visit to Iceland! knowledgeable, good sense of humor and easy to spend time with!! TOUR GUIDE RESPONSE: Thank you too! It was great having you on my tour! We had an amazing and fabulous experience with Guðrún on the two private tours took while we were in Iceland last week. We wish we could give her more than 5 stars, she was so lovely, informative, and her tours were the highlight of our trip! Guðrún was prompt, the van was very comfy, and the sites were breathtaking. She was extremely knowledgeable about everything Iceland. We will be returning with our children and Guðrún is the ONLY tour guide we will consider for future trips. TOUR GUIDE RESPONSE: Dear Tom, thank you very much for this nice comment. I enjoyed taking you and your wife around here in Iceland and I'm already looking forward to seeing you again! TOUR GUIDE RESPONSE: Thank you and welcome back with your family! I'd love to take you around! TOUR GUIDE RESPONSE: Thank you too Faridah, it was great fun to guide you around. All my best to your family and friends! TOUR GUIDE RESPONSE: Thank you for the adventure in Iceland, Lisa. All my best to your family! Gudron Helga is a delightful tour guide, very knowledgeable. TOUR GUIDE RESPONSE: Thank you Lisa. Hope you had good time for the rest of your stay. All my best to your family. It was great to have you on my tour! May I please sing the praises of Gudrun! Gudrun introduced us to your beautiful country today and was a superb ambassador for Iceland! She was a wealth of information and answered all of our questions as well. Her driving skills are impeccable. What a pleasant personality she has. You are fortunate to have her as an employee and we will suggest her to any/all friends who are coming to visit this magnificent country. TOUR GUIDE RESPONSE: Dear Robby, thank you very much for this nice comment. I loved travelling with you and showing you around! Guðrún guided six of us on the Golden Circle tour. She was very informative about geothermal energy, geology, history, and life in Iceland. We appreciated her sharing her knowledge, and her obvious love of Iceland, with us. She was personable, friendly, and helpful. We really enjoyed our day with her! TOUR GUIDE RESPONSE: Thank you Karen. It was my pleasure to take you and your group around! Helga was a great guide in every way. She was enthusiastic, informative and everything anyone could desire. We enjoyed a lovely day with her!!! TOUR GUIDE RESPONSE: Oh thank you so much Susan for this nice comment. I really enjoyed meeting you and taking you around! She was a great guide and showed us lots. TOUR GUIDE RESPONSE: Thank you Sarah! Helga was great. The tour was perfect, she was knowledgable and very pleasant to be with and the car was nice and big. Recommend her. TOUR GUIDE RESPONSE: Thank you Joanna! Thanks for making some changes on the fly for us, it was exactly what we were looking for. Our tour guide was excellent. She was knowledgeable, interesting and a good driver. We thoroughly enjoyed our tour with her and would highly recommend her to other travelers. We give her 5 out of 5 stars! TOUR GUIDE RESPONSE: Dear Alan, thank you very much. I loved being your guide! Great guide, amazing vistas, you couldn't ask for anything more. Our tour and guide were excellent. Guide was personable, knowledgeable and willing to accommodate our needs. Transportation was comfortable and our guide was watching out for our needs and our safety. She was able to give us background stories and history of our stops and was obviously proud of her beautiful country. We would recommend her highly. We stopped at a nice farmhouse for lunch that was good and not completely packed. TOUR GUIDE RESPONSE: Dear Judy, thank you very much for the visit to Iceland. It was a great pleasure to take you around! Our tour to Landmannalaugur was great. It was a good opportunity to get out of Reykjavik and see the inland part of Iceland. Great hiking in the volcanic area northeast of Hekla. Our guide, Gudrun Helga, was excellent and very interesting. I highly recommend both our guide and the destination. TOUR GUIDE RESPONSE: Thank you Frank! Exceptionally knowledgeable guide. Tour was as described with special attention to our wishes for some additional hiking. Managed to take us to a beautiful location, away from the crowds. If you think about what "Tours by Locals" stands for, this is exactly what Gudrun Helga delivered. My third trip to Iceland and this tour will stand out as one of the best experiences I have had! Thank you G.H.S. TOUR GUIDE RESPONSE: Dear Josef, thank you very much for the great rating. It was a pleasure to travel with you and your family. Thank you again and please give your family my best regards!